Salads are so last month . . . They say Rosslyn is a health-conscious town, and to some extent, they're right: We love our sweetgreen, Chop't and AllSpice, and we like staying fit. But consider the humble sandwich: convenient, easy, comforting . . . like an old friend from childhood who's come to brighten your day. Unlike a salad, a sandwich can be eaten while being active. You don't even need a plate: Just wrap it in a napkin and you're all set. You can rush right up Lynn Street with a sandwich in one hand and your smartphone in the other, conducting business and nourishing yourself at the same time. So what if it's a bit less virtuous than something green and crispy? You work hard. You've earned it. You need those extra carbs if you're going to ascend Wilson Blvd. in the summer heat. And you can always save the other half for tomorrow. 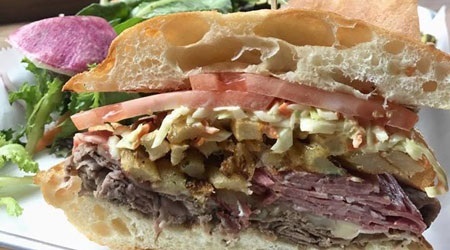 In honor of August, which is National Sandwich Month, we are proud to present our list of the best sandwiches in Rosslyn. This list is based on our own personal research as an office of diligent salad-eaters who occasionally indulge in the comforts of pizza, sandwiches, burgers and beer. Hey, you only live once! AllSpice Cafe & Catering's Turkey Chipotle. 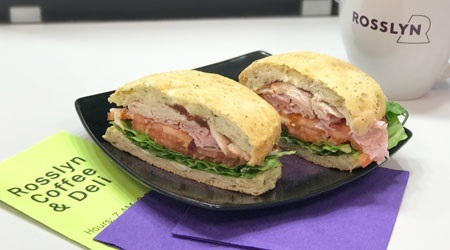 Locally owned and operated, AllSpice Cafe & Catering has been serving freshly made sandwiches, soups and salads for over 20 years. We love their turkey chipotle sandwich (pictured here): smoked turkey, chipotle mayo, pepperjack cheese, arugula, tomato and avocado on a toasted ciabatta roll. Another popular choice is their delicious chicken hummus veggie pita, made with their smooth and satisfying house-made hummus. Learn more. 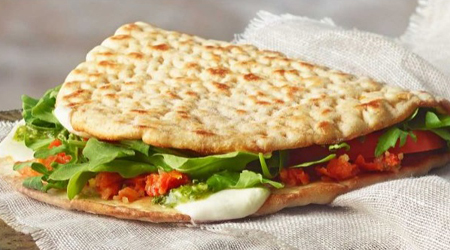 Panera's Tomato Mozzarella Flatbread. At 350 calories, this lighter sandwich features fresh mozzarella, tomatoes and tomato sofrito, baby arugula and nut-free basil pesto sauce with freshly squeezed lemon on whole-grain flatbread. It's delicious, even if it's a more health-conscious choice. Pair it with something like a side salad or a cup of soup and you're all set! Learn more. Jimmy John's Ultimate Porker. 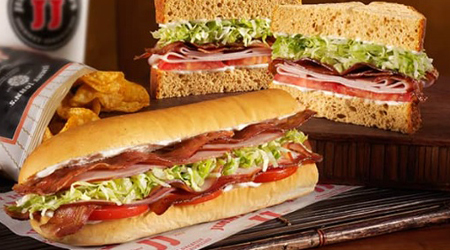 Jimmy John's is a paradise for those who like classic subs with a twist. 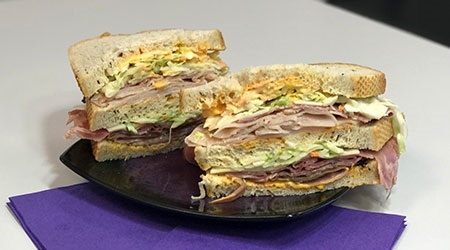 With 8-inch and "gargantuan" subs and also giant club sandwiches, there are lots of choices that will accommodate those with a bigger appetite. Meat lovers will dig this unusual but tasty combo of smoked ham and bacon. It's topped with lettuce, tomato and mayo. Simple but tasty. One of Jimmy's jumbo Kosher pickles makes the perfect complement. Learn more. 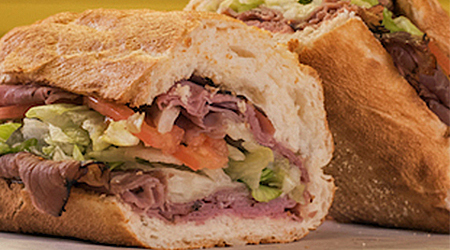 Capriotti's The Bobbie. 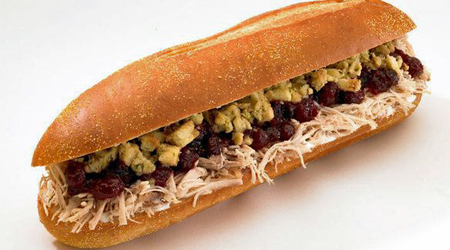 This is the sandwich that cemented Capriotti's reputation as a top destination for subs that use freshly roasted turkey. It includes homemade turkey, cranberry sauce and mayo, enabling you to have Thanksgiving dinner anytime you want. If you're not looking for meat, be sure to try one of their delicious vegetarian subs, including veggie turkey, a veggie cheesesteak and a veggie cheeseburger. Learn more. Potbelly's "A Wreck." This is Potbelly's signature sub and it's quite the meat extravaganza: salami, Angus roast beef, oven roasted turkey and hickory smoked ham with melted Swiss cheese, lettuce, tomato and mayo on a multigrain roll. Delicious and satisfying! Add one of Potbelly's tasty, freshly baked cookies for dessert: They have oatmeal chocolate chip, sugar and chocolate brownie. Learn more. Cosi's Buffalo Bleu. If you need a little spice in your day, look no further than Cosi's Buffalo Bleu, featuring chicken with buffalo sauce, shredded romaine and bleu cheese spread. 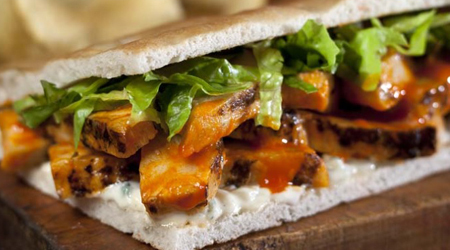 It's served on a warm flatbread, which is baked fresh in the store daily. Some think this sandwich is mild, but you can always add more heat if you want. Heavenly! Learn more. The Perfect Pita's Gyro. If you're looking for a well-made gyro pita sandwich in Rosslyn, look no further than The Perfect Pita. We love their simple yet perfectly seasoned meat topped with lettuce, tomato and tzatziki sauce. You can also try a chicken gyro, pictured here. Learn more. 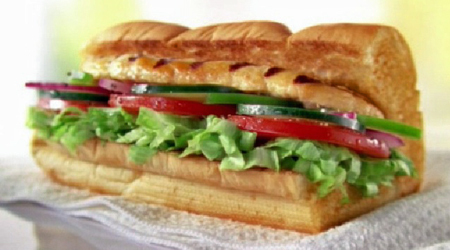 Subway's Oven Roasted Chicken Sub. Okay, so Subway isn't fancy, but it's a solid sandwich shop when you need it. Some of us geekily research the sodium content of our subs because, as you know, lots of deli meats are loaded with sodium. 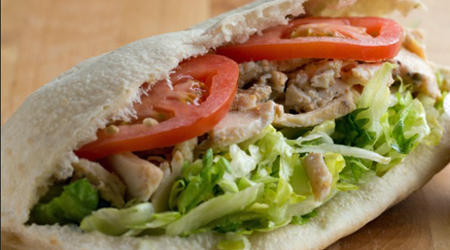 Subway's Oven Roasted Chicken Sub is relatively low in sodium compared to other sandwiches. To make it even better, we order it on a whole-wheat roll and top it with lots of veggies and light mayo. Learn more. We asked readers on our social media channels what their favorite sandwiches were in Rosslyn. Based on their responses, we are adding these "social sandwiches" to this article. Thanks for your suggestions! Please make sure to have your favorite local spots in mind when when we create our forthcoming list of the "Best of Rosslyn." Quinn’s Dagwood Sandwich. Mackenzie from Facebook asked how we could leave out the Dagwood sandwich from Quinn’s! Roasted lamb and corned beef anchor this monster of a sandwich. Served on ciabatta bread, the Dagwood is filled with gruyere cheese, coleslaw, tomatoes and French fries. Come to Quinn’s with an empty stomach and wash down your sandwich with one of their many carefully curated beers and liquors. Learn more. 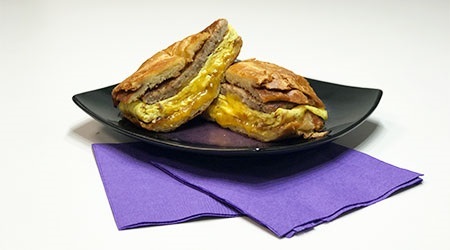 Ahra Café and Sandwich Bar's Breakfast Sandwiches. Eric from Facebook suggested “anything from Ahra," where they carve their in-house roasted meats in front of you. We love their breakfast sandwiches. Served on your choice of bread, Ahra elevates the classic egg, cheese and meat combo by cooking everything fresh to order. We order our breakfast sandwich on a croissant, which was perfectly done at Ahra: not overwhelmingly buttery, light and fluffy. A great start to the day! Learn more. Jon’s Café's "The Rosslyn." Eric also suggested "The Rosslyn" at Jon’s Café. This is a triple-decker sandwich. And with the amount of ingredients stuffed into the sandwich, it’s no wonder that it takes three pieces of bread to hold it all together. Juicy pieces of corned beef, roast beef and turkey are topped with Swiss cheese, coleslaw and Russian dressing on rye bread. Make sure to have a stack of napkins on hand if you want take on this sandwich! Learn more. Rosslyn Coffee & Deli's Rosslyn Club. @Dave4988 from Twitter recommended "The Cobbie" and the Rosslyn Club from Rosslyn Coffee & Deli, so guess which one we tried! The Rosslyn Club is filled with three meats: ham, turkey and bacon. Topped with lettuce, tomatoes and mayonnaise, the sandwich is served on light focaccia bread. This deli also has a full service coffee and smoothie bar to complement whichever sandwich you pick. 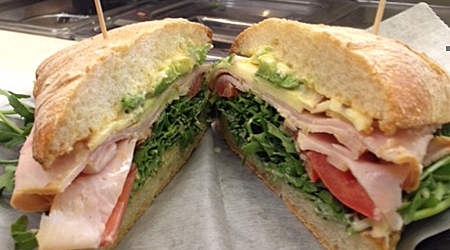 Their “specialty sandwich” selection includes more than 20 options! Learn more. Photo at top: The team at Capriotti's in Rosslyn working hard during a busy lunch hour.